We have officially launched the all new Range Rover Evoque! Now is your chance to take a closer look at the modernist and reductive design of Evoque. Our team of experienced sales professionals will be on hand to tell you everything you need to know about our most capable and refined compact SUV, featuring a wealth of innovative technology and improvements. 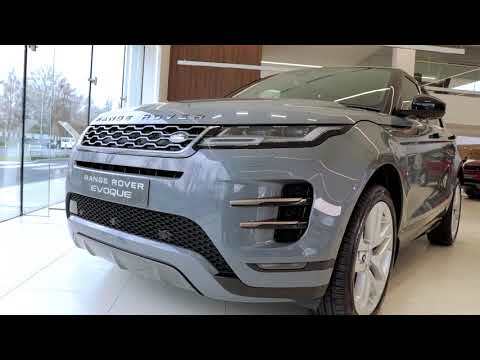 The Range Rover Evoque was announced as Land Rover's biggest selling model in the UK and has continued to thrive after its initial launch, with over 600,000 models being built in the UK. Demand is still increasing for the pioneering luxury compact SUV that delivers critically-acclaimed design, desirability and all-terrain capability to the segment it created in 2011. The Range Rover Evoque has Range Rover's largest trophy cabinet: the model has won more than 200 awards internationally from prestigious 'Car of the Year' and ‘Best Compact SUV’ accolades to special recognition for technology, design and engineering. ​The Evoques Silhouette is instantly recognisable with a dramatic sloping roof line, muscular shoulders and the trade mark Range Rover floating roof. Updated LED daytime running lights have a cleaner more modern style front and rear and a fresh range of 12 exterior colours and 13" alloy whee​ls allows you to tailor the Evoque to your individual style. The Black Design pack further enhances the Evoques dramatic styling by upgrading to satin black 20" alloy wheels and changing all the exterior trims to a Narvik black finish. ​The bold styling outside is complimented by a minimalist architectural interior finished with the highest quality materials. The all new seats offer improved comfort levels with supple leather in a wide range of 11 colours to choose from. The updated InControl infotainment screen is neatly integrated into the dash offering control of the audio system, satellite navigation and Bluetooth mobile devices. If you enjoy your music the optional Meridian audio system offers outstanding clarity and powerful deep bass from systems custom tailored for the acoustics of the Evoque. The result is the very best in world class audio reproduction so music can be enjoyed as the artists intended. ​The new InControl infotainment system offers owners the ability to do more than just make calls from their Bluetooth device. Your mobile device once connected to the vehicle offers a wide range of connected technologies enhancing your ownership experience.The mobile app allows you to check where your vehicle is parked, if its locked, keep track of your journeys and even of a breakdown or in an emergency sending your GPS position to the emergency services automatically if you have an accident all as standard. This can be further enhanced by the addition of InControl Wi-Fi, turning your vehicle into its own Wi-Fi hotspot, InControl Secure offering vehicle tracking and mobile alerts if your vehicle is moved illegally and InControl Remote Premium allowing you to communicate with your vehicle to lock and unlock, beep and flash and even start the heater or air conditioning from anywhere in the world. ​The signature Land Rover Command driving position ensures drivers benefit from an outstanding viewpoint of the road ahead, in Evoque the higher window lines give a sportier, more connected feel without compromising visibility. The independent suspension offers excellent comfort isolating the cabin from bumps and shocks while the short overhands front and rear keeps the Evoques mass centralised offering neat, nimble handling for a car of its size. Active all-wheel drive systems ensure that the driver gets the best grip available whatever the surface and terrain response allows them to tailor the vehicle for tricky conditions like snow or sand. The all new Ingenium diesel engines are up to 17% more fuel efficient, kinder to the environment, quieter and lighter than the outgoing SD4 engines without any loss of performance. Available with a choice of 6 speed manual and the smooth 9 speed automatic transmission. Extended service intervals make ownership more convenient and more affordable with up to 21,000 between services. The Evoque offers a level of capability that sets it apart from the crowd. A true Land Rover at heart the Evoque can tackle challenging conditions with ease. The active all-wheel drive systems automatically send power to the wheels with grip ensuring you keep moving where other 4 wheel drives get stuck and the terrain response system allows drivers of all experience levels to get the best from their Evoque. Capable of wading through 500mm of water the Evoque is as capable as it looks. Read the full review from What Car?. Full Review includes Performance, Ride & Handing, Quality & Reliability, Space & Practicality & much more.